If you have a GE front load washer pump problem this page will help. These washers have an electric water pump that pumps the water out of the washer during drain. There are three things that will cause these washers not to pump out a clogged pump, the pump itself or drain hose and a bad control. 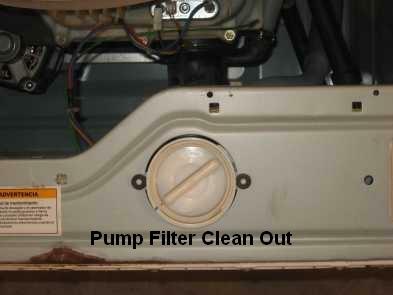 The GE front load washer pump has a filter that you can remove and clean out to unclog the pump. To access the pump remove the front bottom panel off the washer. Once done you should see the pump and the filter. If you lean the washer back before removing the filter then most of the water will stay in the tub and not come pouring out into the floor. This depends on how much water is in the tub because if there is a lot then water will come pouring out into the flow even if you lean the washer back, so be prepared. Remove the filter and clean out all the debris then reach in with your finger to make sure there is nothing in the pump itself. If the pump isn’t clogged, you need to determine if the control or the pump is bad. To do this you must run the GE front load washer pump test. First place the washer in the service mode. 5. Press signal -delay start -signal- delay start. To exit the service mode press signal -delay start-signal - delay start. To enter the GE front load washer pump test mode, rotate the control knob until t05 is displayed in the control panel then press start/pause to enter the test mode. Once you have entered the test mode, P will be displayed and the pump will run for 60 seconds. After 60 seconds it will return to t05. To exit this test mode early press power to return to t05. If the pump runs during the test mode but will not run during a cycle then the control is bad. If the pump still doesn’t run then the pump or the control is bad assuming there isn’t a loose connection and you know the pump isn’t clogged. The only way to know for sure is to place the washer in the test mode and test for voltage at the pump. If you get voltage but it doesn’t run, the pump is bad and if you don’t get voltage then the control is bad.